Google Adsense is the Most Common method to earn revenue from a website or blog in a genuine manner. Not only that but Google Adsense has the highest Payout for its Publisher in the whole Advertising Industry. An Adsense publisher first needs to verify his/her address by Google Adsense Pin Verification letter in order to get payments released. As Adsense is the Most popular It enables you to Maximize Revenue from your online content, also there are many strict rules to survive in Google Adsense, New Bloggers might be knowing Adsense is famous for banning their honest publisher’s also, First of all Google only approve your website or blog if you have quality and original content with genuine traffic. Adsense can also ban you anytime without any notice if some fraud or invalid clicks have been done on your Account. To protect Adsense payment and account Both. Google Verifies your address by sending a PIN (personal Identification Number) to your Address entered In Adsense Account. It is Called Adsense PIN Verification. Many of New Bloggers and Webmasters might not be knowing What is Google Adsense PIN Verification? Does Google Send Mail to Postal Address to confirm Address? the answer is Yes! When Adsense Account Reaches $10, your payments are made on HOLD, you need to Confirm the following three Things to Release your Payments. The first & second point of these are verified instantly. As you may select the easiest payment method which suits you According to your Country. As Almost all over the World Google Pays through Check & Direct Deposit (Wire transfer) however in some Countries Western Union payment option is also available. Tax Information is necessary for earning with Adsense and other popular Affiliate Networks. There is an Online TAX Form which you have to submit it online by Entering your Signature (Digital Signature). When the PIN letter Arrives? The Last and toughest part is to confirm your address which needs time. For confirming your entered Address, is yours. 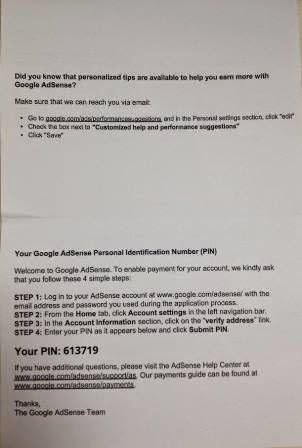 Google will Send you an Adsense PIN Verification Mail to your Given Postal Address. which Arrive in 2-4 weeks depending upon your area. You need to enter the 6 digit PIN which is received, on the payment page of Google Adsense. How Adsense PIN Verification is done? To ensure that the payment reach payee safely since at Google, they take very high-security steps to verify all the things. As in the Above Steps, you see that your PIN (personal Identification Number ) is automatically generated By Google and It is mailed to you by Google Inc. In India It Takes Around 3 Weeks (20) Days to get your Adsense PIN Verification Post on your Address, If you are living is some Small town, It may take more days depending upon the postal service. 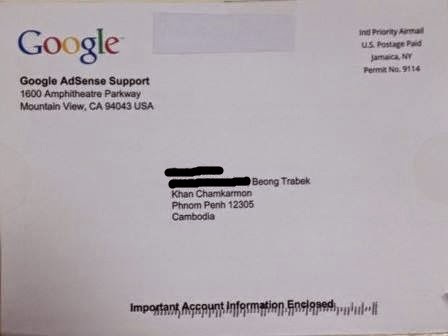 How Does your Adsense PIN Verification Letter Looks? You can view the highlighted portion in above Image, that’s your PIN, When Received you Need to enter the same exactly in account payment page to release your funds. Now you can See the Highlighted portion in above Image, that’s your PIN, When Received you Need to Enter the same Exactly in your Adsense payment Page, to Release your Payments. What to do if PIN doesn’t arrives? If your PIN doesn’t reach you within a month, You can request another PIN and if the replacement PIN. Also if the second PIN doesn’t reach you in next 4 weeks you can again request the last replacement PIN. That is total 3 PIN request can be made. See the Google Support page for more Problems related to your Adsense PIN.